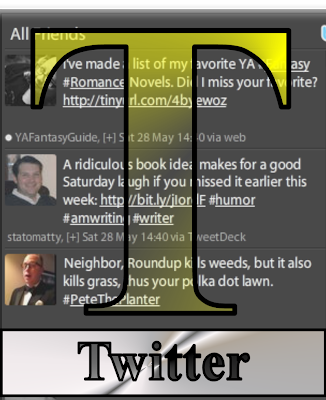 Week four wraps up with the letter "T."
Ah, Twitter. I used to hate it. In fact, I once said if Twitter were a person, I'd punch it in the face. I've mellowed out since then. This is a tremendous tool any writer should take advantage of. You'll find agents, publishers, and (most importantly) other writers floating around the Twittersphere with links to share, advice to offer, and relationships to forge. I'm not the world's most effective Twitter user--I only have about 70 or so followers--but I've found some mentors and people to bounce ideas off. I've found new places to submit work, discovered some small publishers I really admire, and interacted with people who share my interests. If you're not on Twitter, you're missing out. Sign up now! And while you're at it, follow @statomatty! Thanks for reading...and keep watching the blog! We're gearing up for an EPIC FINAL WEEK of the ABC's of Writing!